How do I configure cuteFTP? 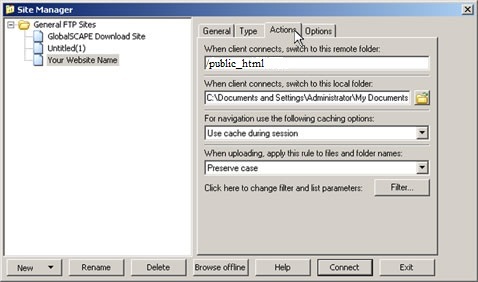 Once you have chosen cuteFTP as your FTP client, you can use the following step by step guide to help you configure it with the proper settings. 4. 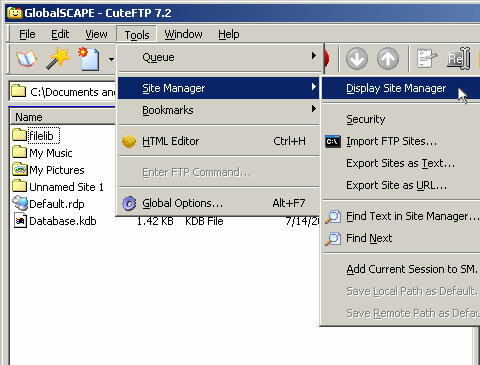 Then, to change the FTP password, click "Change Password" next to "FTP/Control Panel"
Open CuteFTP's site manager under the "Tools" menu, and select "Display Site". Enter a name for your website in the "Label" field. Enter "ftp.yourdomain.com" in the "Host Address" field. Then enter your FTP username and password. Select the "Actions" tab. You must enter "/public_html" in the field that reads "When client connects, switch to this remote folder". You're done! Press the "Connect" button on the bottom of the screen to connect to your server.